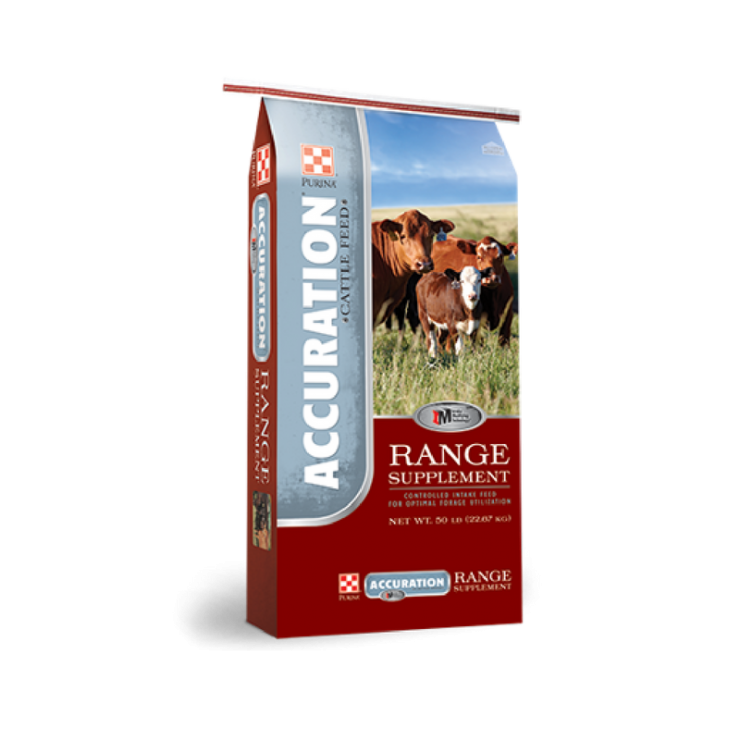 Accuration Range Supplements are an intake modifying technology supplement for cattle on grass. Designed for the cow, heifer development, growing stockers or yearlings, bull conditioning prior to breeding, bull development and even creep feeding. Flexible: Customize rations for different classes of cattle (calves, stockers, bulls, heifers, or cows) and program or performance needs using the same base product. Improves forage utilization: Our research shows a 15-20% increase in grazing time and forage intake for cattle on Accuration® supplement versus a conventional hand-fed supplement. So you more effectively utilize your greatest resource—your grass or hay. Our research shows a 15-20% increase in grazing time and forage intake for cattle on Accuration® versus a conventional hand-fed supplement. So you more effectively utilize your greatest resource—your grass or hay. Limits intake effectively – Saves Feeding Cost: Because Accuration® supplement is offered to cattle free-choice in self-feeders, it is available 24 hours per day, 7 days per week. This decreases delivery cost of supplementation (labor & vehicle cost) compared to hand feeding on a daily or every other day basis. Over 30 years of Purina® research has gone into the formulation of Accuration® so that it will dependably control intake based on forage quality and the cattle’s nutritional requirements. : Cattle get the nutrition they need every day. Predictable performance: Because Accuration® supplement intake is driven by forage quality and cattle requirements, cattle will consume it to provide the nutrition they need when things such as forage quality, weather, stress, and the stage of production changes. Intake changes, but performance stays constant. Self-feed to cattle consuming fair and poor quality forage. ACCURATION® RANGE SUPPLEMENTS are formulated to limit consumption so that cattle will not overeat and receive more than 1/3 total protein from non-protein nitrogen. Important: Follow These Management Practices: 1. When This Product Is Manufactured In The Bulk-Meal Form It Is Recommended That It Be Stored In Flat Storage. 2. When Making A Ration Change, Allow 7-10 Days For Animals To Adjust To The New Ration. 3. Provide Adequate Feeder Space For Each Animal. Feeders Should Be Well Protected And Well Managed To Prevent Feed From Becoming Wet And Molding. Do Not Allow Fines To Accumulate In Feed Trough. Never Allow The Feeder To Run Empty Or To Develop Flow Problems. 4. Consumption Of The Accuration® Range Supplement Grain Mix Will Vary According To Location Of The Feeder, Forage Quality And Quantity, As Well As The Age And Weight Of The Animal. 5. Position The Feeder With The Accuration® Range Supplements Grain Mix Away From Loafing Areas (I.E., Water, Hay Or Sheltered Areas) To Reduce The Consumption Of The Mixed Feed, Closer To Loafing Areas To Increase The Consumption Of The Mixed Feed. 6. Poorer Quality Forage Will Increase Intake Of The Accuration® Range Supplement 33 Grain Mix,While Better Quality Forage Will Decrease Its Intake. Likewise, Limited Quantities Of Forage Will Increase Intake Of The Accuration® Range Supplement Grain Mix, While Unlimited Quantities Of Forage Tend To Decrease Its Intake. 7. Never Feed Moldy Or Spoiled Feeds, Including Hay And Haylages Or Silages. 8. Cattle Must Have Consumed Hay And/Or Other High Roughage Dry Feed Prior To Being Fed The Accuration® Range Supplement Mix For The First Time. 9. Do Not Provide Starved Cattle Freeaccess To The Accuration Range Supplement Mix. 10. Provide Source Of Mineral Free Choice. 11. Provide A Source Of Fresh, Clean Water At All Times. 12. Consult Your Veterinarian For Recommended Health Program For Your Local Area.